The first definite, identifiable, record connected to the Fir Tree Inn comes in 1753. The Buckinghamshire Register of Ale Houses was compiled by the Clerk of the Peace between 1753 and 1828, and records the existence of an inn just south of Hogsty End, Wavendon (as Woburn Sands was then known) on the western side of the road to Woburn. Here, “The Shoulder of Mutton Inn” was licensed to Francis Lee. This stood where Fir Tree Cottage now is, about opposite the old entrance to the Fullers Earth works on Woburn Road. Before this date, there are records in the parish registers of Ridgmont of a Lee family, and a Francis Lee had married a Mary Dudley there in June 1736, and they had had a son, Thomas, christened in August 1739. It is possible that this Francis is the innkeeper, as the Francis Lee of the Shoulder of Mutton died in 1779, and if he were 16 when married, this would make him 59 at time of death. There was also another Lee family, William and Martha, baptising their children around the same time, who christened two sons and a daughter between 1734 and 1739. Perhaps William was Francis’ brother. However, there is a stronger connection to a Lee family of Wavendon. There is record of a birth of Mary Lee to Francis and Sarah Lee in 1717. It will be seen that Christian names were carried down through the Lee family, so it is possible that this Francis was also the father of the Francis Lee who was licensee of The Shoulder of Mutton. This pub name was often used by landlords who were also butchers by trade, as well as being a popular food item at an inn! In the Russell Collection of Bedford Estate papers at Bedfordshire Archives is a note that Francis Lee bought 69 bundles of broom staves from the Duke of Bedford in 1764, for £1 14s 6s. This will not be the last indication that the Lee family were using the woodland around them to their advantage! 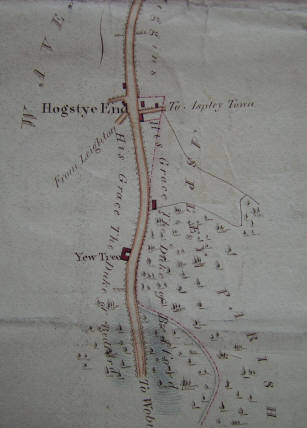 In an early local map of 1765, the Hogsty End part of Wavendon is clearly shown, and also actually mentions two local pubs, both of which have long since been remodelled and changed their names. “The Coach and Horses” is now “The Swan”, and “The White Hart” is now “The Weathercock”. There are also Fullers Earth pits shown near St. Vincents, off Weathercock Lane, as well as the location between Woburn Sands and Woburn where it was still mined until recently. The area off Longslade Lane is shown as brick kilns, and the windmill near to what is now Burrows Close is shown. There are very few houses shown on the road through Woburn Sands, which was the main road through to Newport Pagnell from Watling Street, (what we now know as the A5) at Hockliffe. 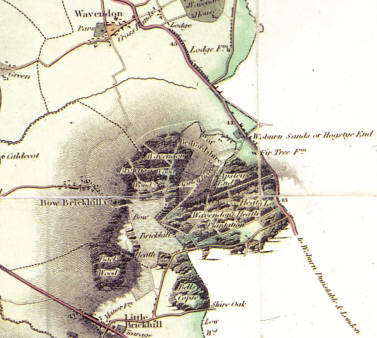 The mapmaker has clearly shown the steep hill between Woburn and Woburn Sands, which was infamous for bogging down horse-drawn carriages until a cutting was made through it. This road was a Turnpike road, and with no organised police force, and most people being armed, this was still a dangerous time to be running a public house on a busy carriage road. We will never know the type of clientele who frequented the old inns of Hogsty End at this time, but I can imagine them as being pretty rough and ready places. The black dots by the road just at the end of the word “Hogsty” is where the original inn stood. According to the Ale House Register, in 1773 Francis changed the name of his inn to “The Grey Hound”. Perhaps they owned one, or there may have been a local champion dog who took part in races over Aspley Heath, which at that time was open heath land, not the dense woodland we know today. The greyhound is also the symbol for the Duke of Newcastle, and a type of mail coach, just the sort that would have being using this road, having turned off Watling Street at Hockliffe. The local landscape was soon changed forever, when Major Francis Moore of Aspley Guise planted 51,376 fir trees on 500 acres of land on Aspley Heath in about 1778. For doing this, he was awarded a gold medal from a society which is recorded variously as either “The Society for Encouragement of Art and Manufacture”, or “The Society for the Cultivation of Land”. The next year, in 1779, Francis Lee died and was buried at Wavendon, but his inn was taken over by his widow Mary. James Asser’s map of Aspley Guise in 1782, shows a “House Stables and Co.” on the inn site, just beside an area called “Stubb’s Earth Pit”, while the present site of the modern pub on the corner of Aspley Hill and Woburn Road is noted as belonging to Mr. R. How. This was Richard How of Aspley Guise, a member of an affluent merchant family who live at The Old House. The family were Quakers, and very much involved in the Friends Meeting House at Hogsty End, which has been operating since the 1650’s. The Greyhound Inn stood beside an entrance to the woods, which led to a Fullers Earth pit, and between the inn and Hogsty End proper was yet another pit. Fullers Earth has been dug locally since at least 1539, when King Henry VIII gave certain lands to one John Sheppard, and notes that it was unknown how long previously it had been dug in the area. It was used to remove the grease from wool, allowing it to be spun easily. The local product was of a very high quality, and there were cases of other inferior product often being sold disguised as the famous “Woburn Earth”. Most mining was done by “bell mining”. A shaft was sunk down to where the layer of Fullers Earth was, then a man was lowered down to dig out what he could, in an ever increasing bell shaped hole. The product was hauled up the shaft to the surface, until the hole created was in danger of collapse. Then another shaft was sunk beside it, the spoil used to back fill the first hole and shaft. It was a very dangerous method of work, which was last used in 1891, although there had been examples of open cast mining in use for many years by then. Many local men would have been involved in mining, refining or transporting the mineral, and working up a quite a thirst doing so. Was this the type of scene inside the original Fir Tree Inn? 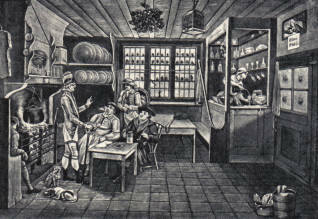 From an illustration of “The Kitchen of an Ale-house”. Mary Lee may have found it hard to keep the business going. No doubt she would have had help from the rest of the large Lee family, but the property, and 35 acres of land running back to Leighton Hollow, (now Sandy Lane) was sold in 1783 from Pithurst and Howard of Newport Pagnell, to Major Moore of Aspley Guise. It is possible that Mary had mortgaged the property with the Newport firm. I wonder if “The Fir Tree” was a “neat little Public House”? It would be nice to think so! There is a burial of a Mary Lee at Wavendon in 1784, and the Bucks Alehouse Register begins to record a Martha Lee as the licensee from this year. Martha was certainly a name used by the local Lee family, and Martha continues in the license book until 1788. For one year, 1786, an Edward Shouler is also recorded, but he was also noted as the licensee of The Leathern Bottel at Wavendon. Could there have been some errors in the clerks work? What is not mistaken is the next change of name, which also occurred in 1786. The fir trees that Major Moore had planted were now about 8 years old, and the old bare Heath was no more now that a carpet of trees was springing up. The Lee family must have been prepared to move with the times, and they renamed the inn, “The Fir Tree”. It looks like Major Moore’s trees were a booming business! 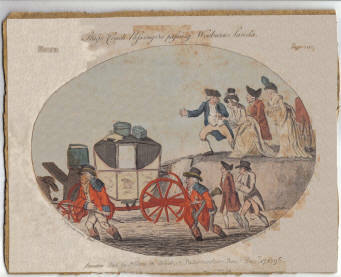 Cruikshank’s etching – “Stage coach passengers passing the Wooburn Sands Dec. 17th, 1796”. The late historian for Woburn Sands, Arthur Parker, recorded that two pieces of land passed from Mary Lee to her eldest son, William, but as he was aware of his late fathers wishes, he passed the land on to his brother, Edward. The Alehouse Register states that the licence of the inn was taken by a William Morris. There is record of a marriage between a William Morris and a Martha Lee in 1789, which would tie into the Martha who appeared to be running the inn since 1784. There are also mentions of Lee families in both Walton and Bow Brickhill in the 18th century, and sorting out the connections is a difficult task. There are two detailed maps of the area, showing the inn and its buildings, both drawn in 1791, and now in the Russell Collection at Bedford & Luton Archives (BLARS R1/221 and R1/290). The first shows the inn buildings clustered around an open yard, with gardens and yards surrounding them. The gardens are to the south of the inn, and would have been seen first if travelling from Woburn. I imagine that quite some care would have gone into these to attract passing travellers and coaches from the main road, who had just struggled over the sand hills, possibly with the passengers having to help push, as in Cruickshank’s cartoon. Perhaps it was also the nursery grounds where Mrs Morris was cultivating trees to sell. The land slopes upwards quite quickly behind the inn, and a measurement of 2 acres and 1 rod is shown for the inn and its grounds. The other map of the same year, 1791, by J. Malcolm, shows the buildings at a slight angle to the road, with trees on both sides of it. It records “The Fir Tree Publick House, 44 miles from London”. Local milestones were very important to travellers, as these were the only signposts at that time, and there were several in Woburn Sands. I was unable to obtain permission to photograph maps in the Dukes collection, so have made these copy sketches myself. Moore’s fir trees were still relatively young, and it is interesting to imagine how the area looked in mature oak trees, so dense that the undergrowth had difficulty in surviving. The oak would have been seen as a profitable crop. I wonder if any of it made it’s way to the British naval ships of that period? Also in the same book, no. 30 on the schedule is identified as “Mermaids Pond”, a local name much older than most would imagine. By now, the corner plot at Aspley Hill, where the modern pub is, had transferred from Richard How to Francis Moore, so he now owned both the site of the original inn, and where it would be based in the future. The next year, Francis Moore sold the site of the original inn to The Duke of Bedford. William Morris continues to be recorded as licensee until 1810, but before then, the name of Edward Lee, son of Francis, begins to appear in documents relating to the west side of the Turnpike Road, where the inn stood. He is mentioned in both 1797 and 1798 in relation to paying for the upkeep of certain sections of the road. (BLARS R4/608/23/1-2). As early as 1793, The Northampton Mercury announced each year the Hogstye End Statute Fair, held at an inn each year, where farmers and estate managers could go to hire on staff. This seemed to alternate between the Coach and Horses (which we now know as The Swan) and the Weathercock, but always ended with a “dinner on the table at one o’clock“. Just across from the old Fir Tree site is another entrance into the woods. Here, the Henry VII Lodge was built in 1810 – 1811. Of course, this is not during the reign of Henry VII, but the name referred to the Gothic style of building. I’m sure the locals gaped in wonder at this building when it was new. It still attracts attention now. It originally had two neat little hedge mazes, but they fell into decline and have been cleared away. They stood just to the north of the cottage, and the full description of that house and gardens can be found elsewhere on this website. Edward Lee and his wife Mary had three sons, and they enjoyed 13 years of running the Fir Tree Inn before his death in 1823, aged 76. His will had been written in February 1818, and tells us he was the owner of three cottages in Leighton Hollow and some land at Longslade. In the name of God, Amen. I, Edward Lee of Hogstyend in the Parish of Wavendon in the County of Bucks, Victualler, being weak in body but of sound mind and disposing mind and memory and understanding but considering the uncertainty of this mortal life do make and ordain this my last Will and testament in manner following. First and principally, I commend my soul to almighty God and my body I desire may be decently interred at the discretion of my Executor or Executors herein after named. That is to say, First I give and devise to my son Wm. 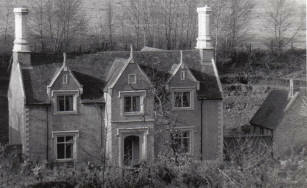 Lee of Leighton Hollow in the said Parish, that messuage or tenement wherein he now dwells and the gardens adjoining the same and one half of the new stable that end adjoining to the house. Second, I give and devise unto my second son Thomas Lee of the same place that messuage or tenement wherein he now dwells and the garden adjoining the same and the other half of the new stable. Likewise I give to my son Francis Lee of Hogstyend that other messuage or tenement called the Old House and the sand pit garden. Likewise, the orchard and the old workshop to the said Francis Lee. Likewise I give all my personal, horses carts & co to my two sons Wm. and Thomas Lee, being at Leighton Hollow only. Likewise I give unto my son Francis Lee the possession of my house and trade as victualler with all my effects in the said house and premises. Item, my will is that my piece of sward ground lying and being at Long Slade in the said parish of Wavendon, be sold by auction within six months after my decease and the remainder of the money when all just dues and debts are all paid the remainder of the money to be equally divided amongst them. And lastly I do hereby nominate and appoint John Piddington of Woburn, Beds, my sole executor of this my last will and testament hereby revoking and making void all other wills and testaments by me at anytime hereto for made and do declare this to be my last will and testament. In witness whereas I, the said Edward Lee the testator, have this day made this my last will and testament contained on two sheets of paper to the first sheet whereas I have set my hand by mark, and to the second and last my mark and seal, this fourth day of February in the year of our lord one thousand eight hundred and eighteen. Signed sealed and published and declared by the said testator Edward Lee as for his last Will and testament in the presence of us who at his request in his presence and in the presence of each other have subscribed our names as Witnesses thereto. Witness Wm. Adams, Cha. Griffith, Robt. Inwood. Administration with the will annexed granted to William Lee and Francis Lee Feb 14th 1825 in the Archdeanery of Bucks. The Will of Edward Lee, leaving the inn to his son, Francis. Parker tells of a Bedford Estates book of 1819 which shows him as tenant of the inn and some 11 acres running over to Leighton Hollow. On his death, William and Thomas, his younger sons, inherited a cottage each, and shared his farming stock, but it was his eldest son, Francis, probably named after his grandfather, who received the inn. William eventually sold his lands to the Duke of Bedford in 1826. Thomas had married in 1815 to Sarah Impey, and died in Wavendon in 1850. On his death, with no children of his own, his lands passed to his nephew, Francis’ son, Thomas. Much of the local Fullers Earth mining was centred on Aspley Heath, which is where the above mentioned Leighton Hollow was. If you walk up Sandy Lane to where the footpath from Holly Walk meets it, there is an area of open ground on your left, where the trees have been cleared away, just passed the big sandpit. This was the site of Leighton Hollow, also known as George’s Square. Sandy Lane was at one time the main route out westwards from Woburn Sands. Before the Bow Brickhill Road was threaded through the fields, this was the way over to the Brickhills, and beyond. A small collection of squatters’ cottages grew up here, and were tolerated by the parish landowners, until they became settled. 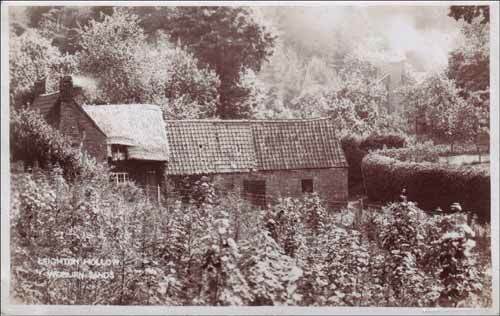 There were very basic houses, really nothing more than converted barns, but there was a well in the centre of the houses, and the Lee family were involved in besom (brush) making, collecting the material they needed from around them in the woods. Much later, the well was used to supply some of the early convalescent homes that were built on Aspley Heath. The water was piped across the Heath in lead pipes; not very healthy. The late Solomon Leadbeater told me that one of his first jobs as an apprentice was to be sent down the well to cut off the lead pipe as low as possible to salvage the metal when the site was cleared. He was lowered down inside the well, which was dry, as far as they could, then he began to cut through the pipe. However, the saw got stuck, and when he conveyed this information to his colleagues up above, they dropped a hammer down to help him. Luckily, it landed in the tiny bit of space his body wasn’t in! 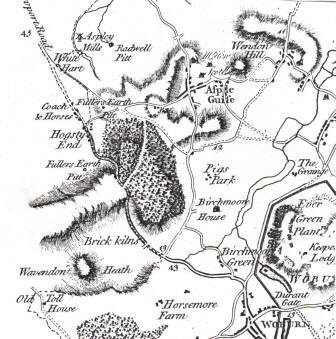 From Bryants Map of Bucks, in 1825. “Fir Tree Farm” is shown. It would seem that this second Francis Lee was baptised on 10th October 1784, but according to the 1851 census, he says he was born in 1770. As well as the inn, he also inherited the old house in Leighton Hollow, with garden and orchard, and in the deeds he is described as victualler and farmer. Francis, born 21st May 1820. Thomas, born 1822. A railway worker at Bow, he died December 1865, crushed between the buffers of two trucks. In 1826, the Lee family bought and mortgaged some land on Longslade Lane. Francis, Edward and William Lee all signed the deeds, and it’s interesting to note that only Francis could write, the others just making their mark. Signed and sealed…the Lee family making their marks. Although identified on a map above as belonging to the Duke of Bedford, the site of the present pub had been sold by the sons of Francis Moore in 1829 to James Young, identified in the conveyance as the local brickmaker. He paid £120. Moore’s sons could not produce any deeds to the site, but believed the site had been a gift from their father. Young was already in occupation of the site, using it as a brickyard. It was described as “…three cottages, brewhouse, woodbarn, stable, hovel and other outbuildings…” which had been erected by Young. The site was much larger than today, having a frontage of 56 yards to the Woburn Road, 48 yards to Aspley Hill, and 44 yards on both other sides. James died in 1839, and his property was split between his two sons, James and Henry, and his wife. James Young junior inherited the Aspley Hill corner plot and buildings. Before the last of Francis’ children was born, there was a major event in the Fir Tree history. Francis is listed in the 1840 Tithe Apportionment as now being at the new site on the corner of Aspley Hill and Woburn Road. Local historian, Arthur Parker, believed the transfer must have been made sometime in the late 1830’s. He surmised that it was possibly a fire which led to the move. Old timber thatched buildings were often destroyed this way, and perhaps Francis wanted a more central location for his business, at the junction of two main roads. With the coming of the railways and canals, perhaps there were fewer carriage customers to stop at the little inn on the roadside. The building on the old site is not included on the Tithe, so it must have been destroyed, by accident or design, before 1840. The Tithe Apportionment also shows that James Young was the owner of the site, so Francis was his tenant. Perhaps they had had an offer from the Duke of Bedford for their old plot, and used the capital to start the new inn. Maybe it was the facility of the brewhouse which appealed to Francis, and he could have started afresh, however, when the transfer was made from the old inn to the new, they decided to take their inn name with them. Lot 1. The Fir Tree Public House & Premises, comprising large parlour, tap room, cellar, dairy, and four good bed-rooms; brewhouse, stable, and other outbuildings, yard and two gardens, with well of excellent water, let to Francis Lee, for a term of which eight years and a half years are unexpired; also a Cottage adjoining, with barn and garden, in the occupation of Jonathan Puttnam. Lot 2. A dwelling house, with bakehouse, containing a six bushel oven and large flour shop, stable, barn, yard, and a good garden, in the occupation of George Warwick, baker.. Also two cottages, with wood barn, and garden to each, in the occupation of James Smith and William Hall. Lot 3. Two cottages, with wood barn and garden, to each, in the occupation of L. Claridge and C. Brown. Lot 4. Three cottages (one with brewhouse and cellar) large garden and yard to each, in the occupation of Mrs Young and George White. Part of the premises have been lately built, and the whole are in good repairs, they adjoin the Turnpike road from Woburn to Newport Pagnel, having a considerable Frontage to the road, eligibly situate for building on. …but apparently this did not sell, as Young’s remained the owners. 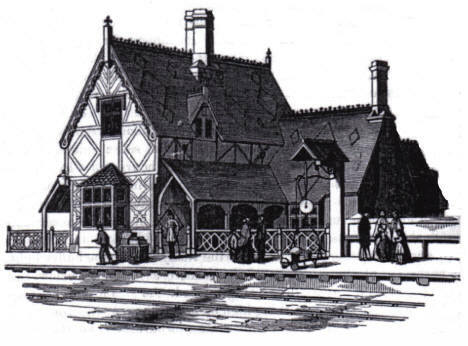 This sketch of Woburn Sands Station was made in 1852. The first proper Census took place in 1841, and although few specific addresses are given, we can find Francis Lee listed under Wavendon as a “Publican”, and 55 years of age, with his wife Mary, 46, and their six children, ranging in ages from 25 down to 10. The railway came to Woburn Sands in 1846, and the new station meant prosperity for the local tradesfolk who could export their goods easier, and a surge of visitors who needed services. It was part of the Bedford to Bletchley line, backed by the Duke of Bedford himself, which was later extended through to Oxford and Cambridge. It is said that the Duke wanted a station at Woburn, but the engineers said Wavendon Heath was too hilly to lay track through. It was an excellent time to have a new inn in the centre of the village. Just to cement the relationship, Francis’ oldest son, another Francis, was now 28, and he married Eliza Peters Young on 3rd July 1848 at Wavendon, who was the daughter of James Young. So the tenant publicans son had married the site owners daughter, and a new chapter of Fir Tree history began.